I received a telephone call from a hunter ('SL') this morning who had a frightening encounter last evening (10/10/2018) at approximately 7PM PT. SL and his friend were deer hunting in a heavily wooded area near Lebanon, Oregon. It was dusk and the pair were on their way out of the woods walking toward their vehicle. 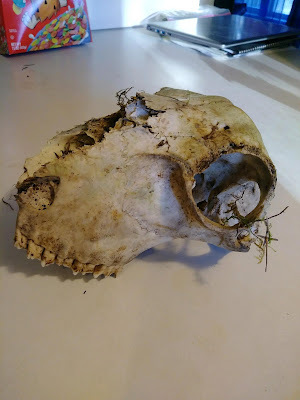 Earlier, SL had found an unusual animal skull (pictured below) and decided to take it with him. 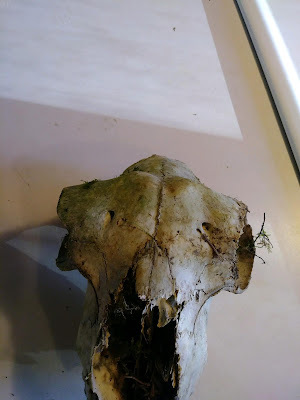 The skull looks like that of a sheep or goat, and had significant deterioration. SL states it is the first time he had seen anything similar in these deep woods. As they were walking out of the area, 3 very loud 'whoops' emanated from the dark forest behind them. They could not see anything, but could tell that whatever made the sounds was very close to them. They ran towards the vehicle and quickly exited the area. SL said that he has hunted the area for many years, and that this was the first time he has encountered or heard anything like this. He said that the sound was very deep and guttural, but also threatening. I asked SL if there were wild goats or sheep in local mountains, which he replied 'no.' He stated that the nearest domestic sheep were located at least 5 miles away, which would not be unusual for a Bigfoot to kill and carry that distance. Is it possible that the skull was part of a collection of 'kill trophies' maintained by a Bigfoot? I discussed this with my colleague, Fortean investigator Timothy Renner. 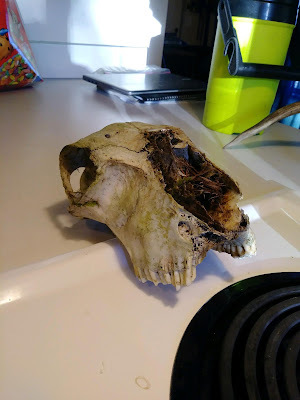 He states that in reported Bigfoot activity areas that he has been investigating in south central Pennsylvania, he has seen more and more animal skulls displayed...in particular Whitetail Deer and Raccoon skulls. Many times, the skulls are placed on tree and stick structures that can be easily seen by passersby.